The Castle is now in the care of the local community who are enthusiastically overseeing a major restoration of the building, subject to available funds and grant aids. 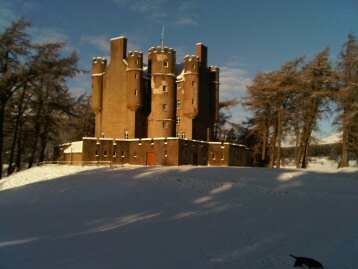 Braemar Castle is an impressive fortress built in 1628 by the Earl of Mar on the site of an even older habitation. Used by Hanoverian troops after the Jacobite Rising of 1745, later transformed by the Farquharsons of Invercauld into a residence of unusual charm. The L-plan castle of fairy-tale proportions with its remarkable star shaped defensive curtain wall, also has a central round tower with a spiral stair, barrel vaulted ceilings, massive iron “yett” and an underground prison. Click above for more information. ½ mile (0.8km) east of Braemar on A93. 11am-4pm Saturday and Sunday from Easter to the end of October.